I’m going to provide even less of a plot synopsis for this book than my usual skimpy effort because a big part of my enjoyment of this book was that I knew so little about it to start with (I listened to it on a whim following a comment by Barbara at the 4 Mystery Addicts online reading group). I quite literally had no idea what it was about when I started and still had no clue what direction the story would take when I was well into its Machiavellian depths and think you should have the same opportunity. So all I’ll say is that it’s one of Hill’s standalone books and tells the story of Wilfred ‘Wolf’ Hadda, a Cumbrian native of working class birth who makes a name for himself in the world of business before his world falls apart in a rather alarming way. If that’s not enough for you to ponder reading it, there are plenty of great easily google-able reviews that will tell you more. For me The Woodcutter ticks all of these boxes with gusto. The audience is drawn in by Hill’s wonderful depictions of Wolf’s out-of-the ordinary young life in the forests of Cumbria and then a very early depiction of his fall from grace. Knowing that an author wouldn’t willingly use up all their most dramatic material in the first few chapters of a novel the reader is left wondering what sort of theme this story will explore..redemption? wronged man? revenge? something else? Using several characters in addition to Wolf, Hill manages to present several versions of the truth, exploring the notion that what’s true depends on the perspective and facts or knowledge a person has at any time. As a reader you are prepared to go along with each subtle variation of reality, never quite knowing where the whole thing is headed, but somehow always feeling confident that the resolution will be a satisfying and authentic one. Along the way there are splendidly depicted images of both the Cumbrian landscapes and the characters (including a terrific fictional dog) who are central to the story. Part of the way Hill draws the reader in and keeps them glued is the interesting array of ideas and themes he explores along the way and unlike so many writers he does this, always, as part of the story. The book is a masterclass in the concept of showing not telling. He examines things like the way the British class structure plays out in contemporary society, the role and nature of the justice system and even takes a look modern psychiatry in a way that makes you think. Literary critic (and professional controversy-starter) Christopher Booker once claimed that there are only seven basic plots for stories and, if this is true, it must get harder to be original as they keep being re-told. In broad ways The Woodcutter is an age-old tale that you’ve heard a thousand times before (in fact it bears a strong resemblance to a 19th Century French adventure classic) but with it’s sparkling dialogue, intricate plot, wonderfully realised characters and the thought-provoking ideas it ponders it is utterly unique. I cannot think of any reader who would not enjoy this wonderful book, crime fiction fan or not, especially via the narration of English actor Jonathan Keeble whose mastery of accents and gender roles was, as always, outstanding. This entry was posted in book review, England, Reginald Hill. Bookmark the permalink. Bernadette – Thanks for your review; as always, an excellent one. Thanks also for your comments on storytelling. It’s definitely an art, isn’t it? It doesn’t matter how exciting a plot idea is, or how interesting/funny/compelling/endearing/etc. the characters are, if the story isn’t told well, a novel suffers. It just does. I’m so glad you’ve reminded us of how important good storytelling can be, and I’m glad you liked The Woodcutter as much as you did. You’re quite right, too, in my opinion. Reginald Hill is a skilled storyteller. You make it sound very tempting — though I have seen a mix of reviews on this one. I did read a lot of the Dalziell/Pascoe novels until their pace got so somnambulent that I gave up, and I tried a couple of the Joe Sixmith ones, but I don’t think I’ve tried a standalone. I know he is a very highly regarded author (very much by other authors, also), so I probably should try him again, especially in view of the Cumbrian setting. 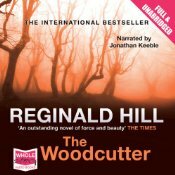 I have not gotten into reading Reginald HIll’s books, although a reading friend likes the Dalziel/Pascoe series. I will put this on my TBR list. Well actually he annoys me, reading his books is similar to watching a TV detective tale with a multitude of ads – he keeps shifting the scenes, he does this of course to trick the reader, we are not permitted to find the answers until he decides when and by that time our concentration span has ebbed. The Woodcutter was an easier read, yet I felt like taking all the pages out and assembling them into a coherent order. Probably that is why I am not an author……..